Around with the wind they go, each boat going through ail the points of sailing in turn: beating, running, and reaching. 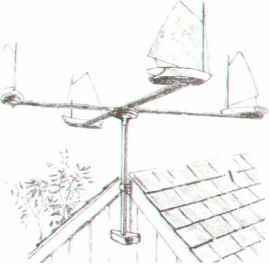 Mounted on a pole in the yard or clamped to the gable end of a garage or utility shed, the salty-looking little catboat windmill provides an interesting and decorative means of judging wind strength. We remember seeing one of these "wind machines" on New York's Long Island several years ago, and recently rediscovered the design in Marlirtspike Sailor, a classic book on knots and ropework by Hervey G. Smith. We designed a hull that can be easily carved from soft pine and utilized a lazy-Susan bearing for the arms to pivot on. To carve the catboat hulls, glue together (using water-resistant glue) two pieces of % x 1 Yt x 8" soft pine. Sandwich these between two pieces of % x 114 x 8" pine, as shown in Figure 2. Cut a Va x 14"-deep groove down the center of the laminated block for the i x 1 x 8" plywood keel. Be sure to use waterproof exterior-grade plywood. 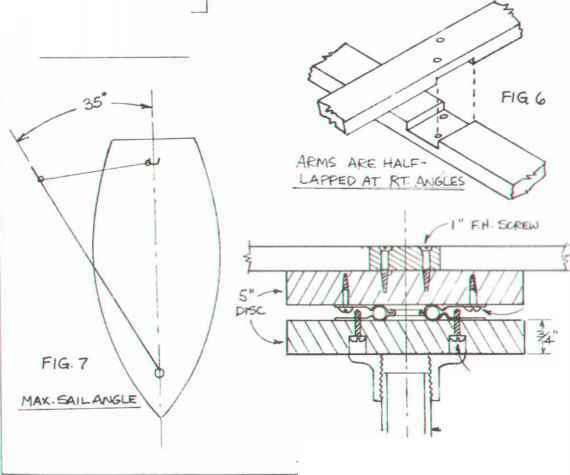 Bandsaw or rasp a sheer curve on the deck from stem to stern, then proceed to carve the hulls, using the illustration as a guide. When hulls have been shaped and sanded, the keels are glued in place, shaped to fair with the stem, and notched to receive the arm Shape the masts, drilling holes for rings to hold the sails before gluing the masts into the dcck sockets. String forestay wire from the mast to a small screw eye at the bow. Sails are cut from sheet zinc or galvanized steel and painted white. Fasten the sail to the mast with heavy brass wire or soldered split rings. 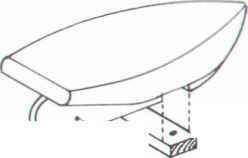 Adjust the mainsheet to allow the sail to swing freely to either side as shown in Figure 7. When the four hulls have been completed, cut two arms of 14" hardwood, 1J4" wide x 36" long. Half-lap these at the center as in Figure 6. Cut two 5" discs from %" stock and fasten a lazy-Susan bearing between them. These bearings come with mounting instructions, and the 3" size needed here sells for about one dollar. 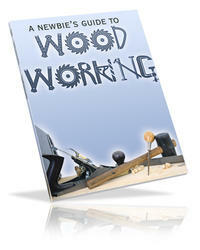 (It can be purchased from The Woodworker's Store; see p. 243 for the address.) The two catboat arms are screwed to the upper disc and a boat is fastened to the end of each arm with a screw driven through the arm and into the hull. 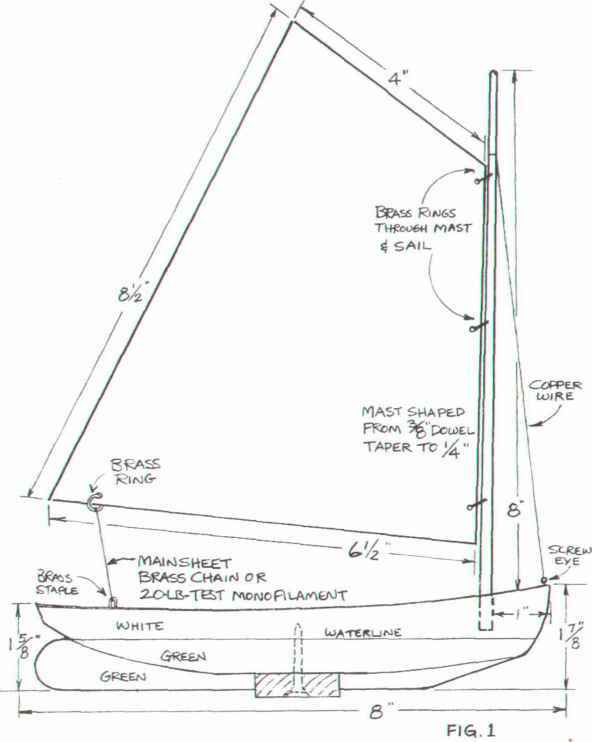 The catboat race can be pole mounted or fastened with pipe to the gable end of a guragc, .is shown in the illustration. 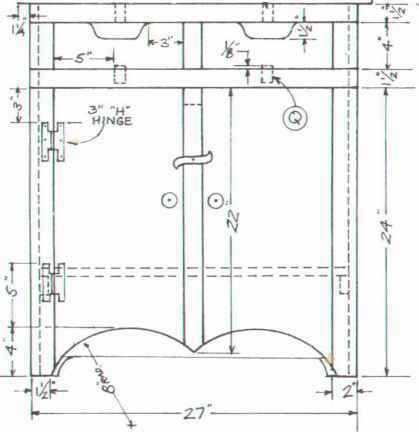 It may also be fastened to a roof ridge by cutting equally spaced sluts in the lower five inches of the pipe .md bending the four fingers thus formed to conform with the rtx»f pitch. Holes are then drilled near the ends of the lingers for mounting screws. Apply rooting tar or caulking compound over the holes before mounting. Lubricate the bearing periodically with bearing oil or pack it with light grease.